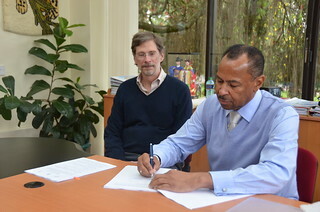 Recently, ILRI director general Jimmy Smith signed a Strategic Partnership Agreement between the Swedish University of Agricultural Sciences (SLU) and the CGIAR Research Program on Livestock and Fish. According to program director Tom Randolph, this is a key milestone in the evolution of the program, adding strong academic expertise to the existing livestock and fish research for development partnership. The agreement was earlier signed by SLU’s Vice-Chancellor Lisa Sennerby Forsse. In the coming two years SLU will contribute with expertise in the area of heard health but also investigate the possibilities of deepening the cooperation in the areas of animal genetics and feed and forages.